Dance, which, in the realm of altered body, silence, and movement into which it projects a subtle version of the dancer, makes possible immobilization, the genetic element of motion, allows all sorts of extraordinary movements, including an auto-mobility of the inanimate. The first couple of times when its winding mechanism came to a stop, the doll became again motionless; the third time the winding mechanism came to a stop, its faint sound no longer audible, the doll continued to move, having acceded to the auto-mobility allowed by dance in the realm of altered body, silence, and movement in which it projects a subtle version of the dancer. When the mechanical doll attains the state of dance, a cessation of its movement would be due to its becoming frozen in dance’s realm of altered body, movement, silence, and music. The notion of rewinding the doll’s mechanism occurred to its erstwhile master, but, being himself a dancer, he dismissed it—he must have sensed that he would not be able to do so since the doll was then frozen still, thus withheld from time, with the consequence that the action of rewinding it, one that takes place in time or is a form of time, could not be effectuated until the doll was no longer frozen but subject to time again. The doll resumed its movement on its own once the silence-over had receded. Jalal Toufic is a thinker and a mortal to death. He was born in 1962 in Beirut or Baghdad and died before dying in 1989 in Evanston, Illinois. 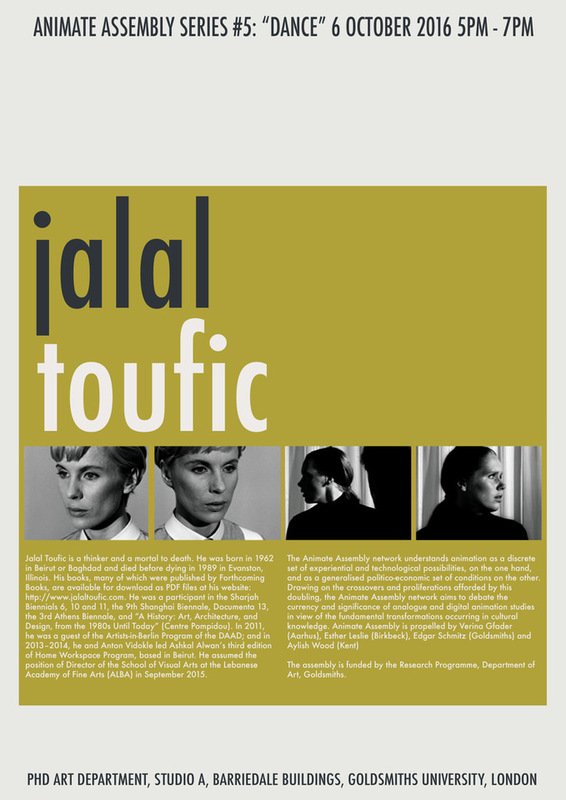 His books, many of which were published by Forthcoming Books, are available for download as PDF files at his website: http://www.jalaltoufic.com. He was a participant in the Sharjah Biennials 6, 10 and 11, the 9th Shanghai Biennale, Documenta 13, the 3rd Athens Biennale, and “A History: Art, Architecture, and Design, from the 1980s Until Today” (Centre Pompidou). In 2011, he was a guest of the Artists-in-Berlin Program of the DAAD; and in 2013–2014, he and Anton Vidokle led Ashkal Alwan’s third edition of Home Workspace Program, based in Beirut. He assumed the position of Director of the School of Visual Arts at the Lebanese Academy of Fine Arts (ALBA) in September 2015. The Animate Assembly network understands animation as a discrete set of experiential and technological possibilities, on the one hand, and as a generalised politico-economic set of conditions on the other. Drawing on the crossovers and proliferations afforded by this doubling, the Animate Assembly network aims to debate the currency and significance of analogue and digital animation studies in view of the fundamental transformations occurring in cultural knowledge. Animate Assembly is propelled by Verina Gfader (Aarhus), Esther Leslie (Birkbeck), Edgar Schmitz (Goldsmiths) and Aylish Wood (Kent). The assembly is funded by the Research Programme, Department of Art, Goldsmiths.